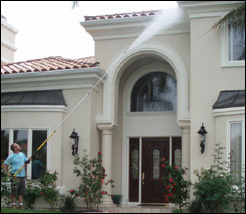 Advanced Window Cleaning & Pressure Washing offers a full spectrum of professional hot water power washing services for both residential and commercial settings. Our power washing equipment is comprised of heavy-duty, industrial level trailer mount power washers and rigging with the capacities to handle any application, big or small. If it can get wet, we can clean it, restore it and make it look new again. Power washing can remove years of dirt accumulation, oils and grease, environmental pollutants, mildew, and algae from a multitude of surfaces. Not all surfaces are cleaned in the same manner though. Power washing is a technical proficiency. Advanced Window Cleaning & Pressure Washing is highly skilled and trained in proper equipment use and knowledgeable in multiple cleaning applications. Too often power washing operators rely purely on high pressure, or PSI, when cleaning. This is due to lack of knowledge and inadequate equipment, and has the potential result of detrimental damage to the item being washed. By employing hot water (200+ degrees °F), the appropriate detergents and cleaners, and the sheer volume of water produced by our equipment, we can get superior results with much lower pressure. We utilize high pressure where demanded, and low to moderate pressure for more delicate surfaces. More often than not the only time the exterior of most homes get any attention is when they are painted. After that the house exterior is ignored, and that brand new appearance slowly accumulates dirt and environmental fallout, becoming dulled, grimy, and sometimes creating the perfect substrate for mildew and algae growth. Your house is your biggest investment – you keep the inside clean, why not the outside? Our house washing service is a hot water wash, utilizing biodegradable detergents to get the best possible results. We wash from the roof trim line, under the eaves, and all of the house siding down to the foundation. Our process revitalizes the appearance of the house and restores that brand new, just painted look – whites bounce and everything looks crisp and brilliant. If you have a tile roof with black, brown or greenish staining you may be surprised that it is not dirt causing the discoloration. The problem is actually the growth of algae. This normally appears on a north slope where shade and moisture support its growth and it uses the roof surface as a nutrient base. Other variables besides the direction your house faces are the type and grade of your shingles or tiles, and whether you have a lake or other water body nearby creating abundant moisture in the air. Shade on your roof provided by nearby trees can also promote growth, as does tree leaves that sit on your roof for extended periods of time. Though primarily a cosmetic issue, some experts say algae may cause some roofs to deteriorate prematurely. 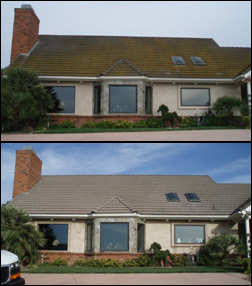 We are very knowledgeable and successful at removing the growth and restoring your roof back to its natural color. Though most of the roof washes we perform are on tile roofs, we can also remove algae growth from composite and shingle roofing. can remove loose superficial dirt, but deep cleaning with hot water and high pressure is required to remove the soils and stains, and restore the surface. 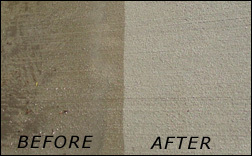 We have specialized equipment just for cleaning driveways, walks and other hard surface ground areas of your home. Concrete, brick work, flagstone, and other types of stone are all masonry surfaces that we can clean.